Although situated on the River Clyde and near to the centre of Scotland’s motorway system with major links close by. 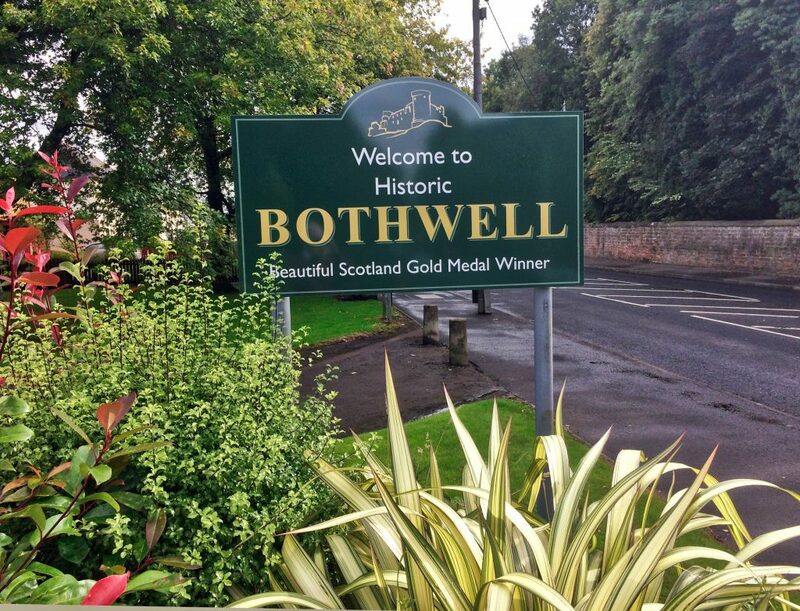 Bothwell has the air of being ‘off the beaten track’. The conservation village is well known for its high-quality housing, boutiques and fine dining. Despite being a modern and vibrant community, it boasts a long and dramatic history that parallels the history of the Scottish nation itself. The Romans were here and had a camp at nearby Bothwellhaugh. St. Mungo sent out his acolytes from Glasgow in the sixth century to found a Christian settlement on an already pagan, holy shrine. The present magnificent parish church, part mediaeval and part Victorian, stands on the same site. In the 12th century Bothwell’s earliest ruling family, the Olifards, built a motte and bailey castle near the present parish church. Later lords of Bothwell built a great new stone castle on the banks of the Clyde, the ruins of which can still be visited. Besieged by by both Edward 1st of England and Edward 3rd, this castle, under the Douglas family, would become more palace than fortress and a centre with diplomatic links to the great courts of Europe. Part of it was demolished in the late 17th century to build a new mansion that after several re-buildings would become a stately home of unrivalled splendour housing a magnificent art collection. Sadly it was demolished in 1930. Bothwell Bridge is so ancient that origins are unknown but as it has done for centuries, it still provides an important river crossing. Here in 1679 the Covenanters were defeated by a government army under the Duke of Monmouth. A monument to the battle may be seen at the bridge. Many famous personalities have been associated with Bothwell down through the centuries including William and Dorothy Wordsworth, Sir Walter Scott and James Boswell. Present-day Scottish literature is represented by the author Christopher Brookmyre, who lives in the village. The 19th century industrial revolution came to Bothwell with the establishment of a coal mine in the centre of the village. This lasted until the middle of the 20th century, but few signs of it still remain. For those who choose to come off the main road and visit, Bothwell has much to offer with its great castle, splendid church, and ancient bridge and battlefield, Georgian and Victorian mansions and its contemporary attractions of good shopping and dining. Few Scottish communities can better this combination of history and modern amenities.